The Zeitah Excavations launched its inaugural season during the summer of 1999 with a 55-member international team of professional staff and volunteers, including students from Pittsburgh Seminary. Under the direction of Dr. Ron E. Tappy, G. Albert Shoemaker Professor of Bible and Archaeology, volunteers have unearthed remains dating from the Middle Bronze Age (ca. 2000-1550 BCE) to the Ottoman period (1517-1917 CE). The principal work of the excavation has concentrated on the Iron Age II levels, which date to the time of the Hebrew prophets and kings in the Old Testament, and the site itself may represent the ancient biblical town of Libnah. In July 2005, excavators discovered a rare find: an inscription securely dated to the 10th century BCE, which, according to traditional chronologies, represents the period of King Solomon’s reign. The two-line inscription, incised on a 37-pound limestone boulder embedded in the stone wall of a building, is the earliest securely-dated example of the complete Hebrew alphabet. The letters incised into the rock display a transitional script that was emerging from Phoenician and leading to the Hebrew national script of the ninth century BCE. Scholars refer to this type of inscription—one showing the linear alphabet with the letters in their standard order—as an abecedary. Since it was found in a securely datable archaeological context, the discovery made world news and represents an important contribution to the vigorous debate over the history and literacy of the region in the 10th century BCE. One of the major goals of The Zeitah Excavations consists in clarifying our understanding of life in a typical town setting in ancient Israel. Since nearly all archaeological investigations throughout Israel have concentrated on large, urban sites, our view of the lives of the majority of ancient Israel’s population needs further refinement. As a strategically located “outlying” town situated in the lowlands region southwest of Jerusalem, Zeitah (Hebrew “Zayit”) presents a unique opportunity to correct this situation. Its manageable size and geographical location at the crossroads of several major ancient roadways in the Beth Guvrin Valley, roughly halfway between the Israelite city of Lachish and Gath of the Philistines, make Tel Zayit ideal for archaeological exploration. The project has incorporated a full-scale program of field exploration and study. 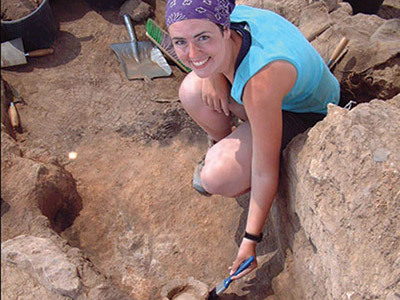 In addition to learning field methodology by working side-by-side with internationally known professional archaeologists on site, volunteers have participated in an academic curriculum addressing specific aspects of archaeological work, as well as more general themes related to the study of life in ancient Israel (such as historical geography). Special lectures by leading American and Israeli archaeologists, as well as biblical scholars, have supplemented practical field work, and guided field trips to major regions of the country have helped open the world of the Bible for students from all educational backgrounds. Further, participants’ familiarity with modern Israel has been enhanced through sustained, personal, cross-cultural interaction with the residents of the kibbutz that continues to house our (now study) team. In these ways, The Zeitah Excavations fosters a greater understanding of the literature of the Bible and a more intimate knowledge of Israel’s historic past and storied present.